Custom HTML code or content can be added to your ESP Website through the Content Library or Pages of your website. If you are familiar with HTML, from within the content editor, switch your view over to HTML and edit the HTML to accomodate your needs. 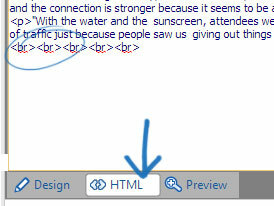 If you are not familiar with HTML and pasted the copy into the content area, you will want to use the format stripper button from the Design view in the content editor. Here you'll see several different formatting options available to you. Stripping CSS formatting will remove any styling applied to your content. Stripping the font elements removes any declaration of font-size, or font-color, after removing the font element you will have all same sized and same colored text. Sometimes, when you copy and paste text from a word editor in your HTML code you have extra <span> tags that are not associated with anything, they only make your HTML code harder to read than it should be. Stripping the span elements will clear up your code, leaving it organized and readable. When you copy and paste content directly from word a lot of special styling and formatting comes with it. Stripping the word formatting will allow you to better control and format your content through the Design view.